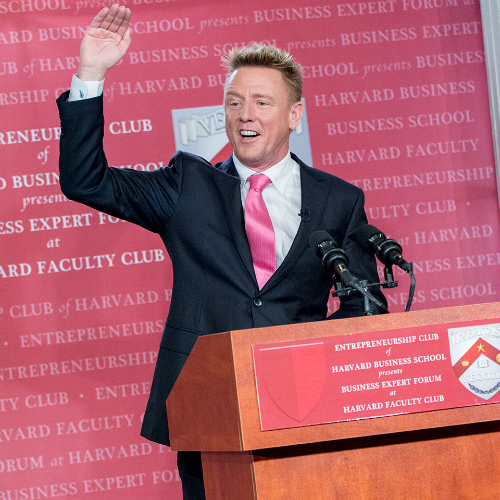 International business speaker and trainer John Rankins spoke at Business Expert Forum at Harvard Faculty Club sharing his message of inspiration. The message he shared with the audience is simple. Life is beautiful, life is unfair, life will knock you down, but life is still beautiful. “I’ve had challenges all my life and a lot of them haven’t been fair. The second being that life will knock you down. Even though I became a millionaire, I lost everything several times,” Rankins said. He discovered that the director of his company had stolen everything. He had to leave his country on a boat to Singapore just to go under the radar where he set up a new company because he was blacklisted in his own country. He did get to buy his mother a house before it happened. “That’s why life is not fair. Life will knock you down, but at the end of the day life is beautiful,” he said. Rankins is also helping make life beautiful through his 1,000 smiles campaign. It started seven years ago when he met a young girl with a cleft palate and a cleft lip. Her mouth and face were disfigured. “When I saw her begging on the street, it brought me to tears. It made me appreciate how much that I have in my life and how grateful I am,” he said. He created a campaign called One Thousand Smiles, to make a difference in the lives of 1,000 children. So far he has paid for the surgery of 121 children. He donates all the proceeds from the programs the sells online at his website JohnRankins.com as well as his book “Life Mastery Playbook,” to these children and their surgeries. “That’s my cause. I live in the Philippines so this is my community and I believe in giving back to where you live and to your community and this is dear to my heart,” said Rankins. John Rankins is the international best-selling author of the Life Mastery Playbook, founder of the Revolution Mastermind and president of Optimo International. Known for his entrepreneurial focus on sales and leadership Rankins’ mission to develop leaders and change lives is the reason he’s one of the most sought after business trainers alive today. His sales and training expertise has built more than 2,000 people’s businesses over the last 25 years with businesses generating more than 100 million dollars in revenue in the last five years alone. He has trained more than 10,000 people in sales and leadership and has a massive sales force of 4,000 all over Southeast Asia. His world class programs transform the lives of people; both personally and professionally, doubling sales in more than 20 companies in less than 90 days in the last two years.